In this edition of Garden Plot, Garden Editor Mike McGrath gives advice on how to stop morning glory from returning year after year and how best to contain the spread of creeping bamboo. Meet Mike at Homestead this weekend! Mike will share his top tomato tips at 11 a.m. on Saturday April 6 at Homestead Gardens in Davidsonville — just outside of Annapolis. Click here for details. The lovely weather making us all a little goofy is delightfully tempting to gardeners, which means that it’s time to talk tomatoes and itchy fingers! I always say to wait until nights are reliably in the 50s before you install tropical plants like tomatoes, peppers, cukes and such outdoors. And yes, the forecast for the next bunch of days is exactly that. But it’s April! And if you want to find out why this is called “the cruelest month,” go ahead and plant your tomatoes now. The garden center will be happy to sell you replacements in May. If you have started your own plants from seed inside, you can and should put them outside in full sun for the next few days. Just be sure to bring them back inside by dinnertime on the first night when temperatures are predicted to drop into the 40s. Yes — but first, please get out of this ‘chemical first’ mindset; its hazardous for you and for the environment. Now — morning glories are annual plants; they die at the first frost but leave behind lots of seeds that survive the winter. So consider covering the area of their emergence with 4 to 6 inches of nondyed wood or bark mulch for the season. Smother that next generation and the problem is no more. Otherwise, rip weekly. You know what the vines look like now, so let them get a foot or so tall and rip them out of soaking, wet soil or clip or hoe them off at the soil line. If you prevent flowers from appearing this year, there will be no ‘glory’ in your future. I asked Moritz what color the flowers were and luckily, he said they were purple. 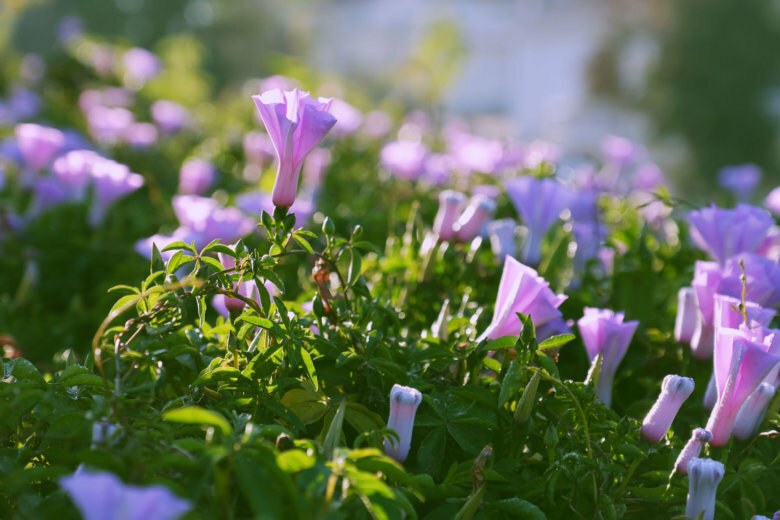 If the flowers were white, his problem would be the look-alike plant known as bindweed, which can be extremely difficult to control. The secret to eradicating garden variety morning glory is simply to prevent it from flowering — or quickly destroy the flowers before they can set seed — for a single season. Morning glory is an annual that relies on dropped seed to re-establish itself the following season. The seed is formed inside little pods that appear after the flowers fade. So keep pulling the plants before they can flower, pinch off the flowers or use a small flame weeder to torch any flowers or seed pods that appear. Once running bamboo gets established, any lasting solution will be expensive, Joni. We’ll discuss your options below, but for now let this be a warning to others about bad bamboo! Theoretically, yes, a buried barrier of sheet metal could stop the invasion of bamboo, Joni. But it would only work if it were installed by a landscaper with enough knowledge to overlap the sheets to avoid any gaps in the underground wall. A better choice would be professional rhizome barrier — a thick roll of high-density polyethylene that varies from 18 inches to 4 feet in height. A trench is dug at the property line and the barrier is installed deeper than the visible roots. Yes, it’s expensive but the cost will be borne by your neighbor; the Virginia Supreme Court has ruled that removal and/or control of running bamboo is the responsibility of the homeowner where the stand originated. You should both contact the company that handles your homeowners’ insurance to see if they can provide any help. Warning: Without control it will continue to run, eventually damaging structures and foundations. More info can be found here.